Or put in more psychological terms: making the unconscious, conscious. Or said in more spiritual terms: shining the light on our darkness or shadow side. So, if we don’t know that we are acting or reacting to circumstances and people in our life out of some unconscious patterning from our past or childhood, how do we then become aware of it? 8. My partner will notice that I am not being my true Self! What do YOU do when you are hurt or reactive? Do you see any correlation to what you may have done in response to dysfunctional family patterns? Bless those that mirror us even though it is so painful! Dancing on the edges of my perfect imperfections, with each sweeping step I slough off a little more of the dusty, caked on layers of experience from my past to love and see my partner and my self more clearly. Love brings up all that is in its way to clear the path back to love. An intimate relationship with our partner, children, or family members is a perfect place to get a good look at the unconscious soot that has covered our hearts and clouded our thinking. “Dancing on the edges of my perfect imperfections.” It sounds so poetic, doesn’t it? Yet in those brief, chaotic moments of experiencing my judgements, heart closing down, or projection of my fears on my partner, I am far from feeling elegant or Rumi-like. Where else could I get such a quick and thorough dose of my own medicine? Our nervous system is hijacked (fight, flight, freeze) when we’re triggered by something deeply unconscious, or mildly or severely traumatic (I recommend books and videos by Dr. Peter Levine PhD http://www.traumahealing.com/somatic-experiencing/peter-levine.html, trauma recovery through Somatic Experiencing). It is like being pulled out to sea in an undertow. We long for the safety of the shoreline, but there we stay thrashing about for what is usually a little while, but may feel like an eternity. Self awareness is key to coming back to shore. We can feel and sense into part of our body that feels grounded and peaceful – a technique to stay present to what is real and what is happening to us. Attention to the breath is often a wonderful place to anchor ourselves to the moment, but at these times of heightened reactivity our erratic breath may not be the best anchor. Conscious relationship IS a daring path to enlightenment for some of us. I think it is a warrior’s path to enlightenment – not for the meek or weak-hearted. I am grateful that in this lifetime, I am naturally committed to taking responsiblity for my reactions through deep reflection, meditation, or consulting with friends or therapists. “You don’t have to change yourself. You don’t have to sit still. You don’t have to sit cross-legged. You don’t have to make your mind blank. Even though I practiced yoga for over 15 years, had an Indian Guru, and meditated and breathed in silence for weeks at a time, it wasn’t until 2006, after a series of intensely confusing relationship dynamics and subsequent endings, that I discovered my tendency toward “codependent” behaviors and thought patterns. I honestly had no clue what was going awry in these intimate relationships, but I knew I couldn’t keep doing what I was doing. Over the years I had heard the term codependent, and thought like most people, that a codependent was basically a needy person. This is not exactly the case, although sometimes neediness is manifested when we get the “codependent crazies.” There is much more to discover about the codependent personality that is enlightening, juicy, and life altering. To really catch ourselves in our patterns, we must become keenly aware of our own subtle internal thought processes and feelings when relating to ourselves and others. This is the yoga of self-awareness. We use everything in life as material to wake ourselves up. Understanding patterns of codependency gives us a framework for intra and inter personal dynamics that maybe we didn’t learn about in a yoga class or training. Understanding our patterns in yet another way, allows for growth and change. As yogis and yoginis, isn’t awareness of self and other what we aim for in our practices? Codependents have been known to give too much, too quickly. And as yoga teachers we are giving all the time. By discovering my own codependent patterns over the last 6 years, and by observing thousands of yoga teachers and students, I notice that most women and most yoga teachers have the tendency toward codependent thought and behavior patterns. There are many books and web sites that discuss the traits and habits of a codependent type personality. I am not going to reinvent the wheel here, but I will give a general list of traits. I suggest that you to read some books by Melodie Beattie. The book, “The Seven Jewels of Codependency” by Robert F. Willard and Michael Gibertini, is a great tool for reframing our behaviors in a more positive light. Codependent, or codependency, is a psychological term denoting a set of recurring thought and behavior patterns exhibited by an individual. These tendencies are said to have originated from experiences in a dysfunctional family system where one or more members had a mental illness, exhibited compulsive behaviors, or abused substances such as drugs or alcohol. These family members may have consciously or unconsciously inflicted physical, emotional, or mental abuse. Typical patterns of codependency include: over-giving, low or exaggerated self-esteem, challenges maintaining intimate relationships, difficulty in properly caring for one’s own needs, difficulty setting physical or emotional boundaries, excessive care-giving, external focus on approval and self-worth, people pleasing, attempting to exert control over the thoughts, feelings, or actions of others, hyper-vigilance, excessive worry how others may respond to one’s feelings, undue fear of being hurt and/or rejected by others, and perfectionism. Now I am going to tell you about some of our good qualities. And we get even better once we become aware. We have a natural intuition that keeps us safe from danger because we can sense when situations are getting weird and vibes are getting sticky. We are fairly psychic and empathic. We are good people. We are devoted friends and are ready to lend a hand or ear when someone needs us. We sincerely care about people, animals, and the environment. We give nice gifts and remember birthdays. We listen well (when we are not obsessing about others, or “spewing our stories”). We have great parties, we’re great hosts, and we draw people together. We are honest. We make fantastic employees because we work extra hours, do more than is expected of us, and are great team players. As partners, we are very attentive and give lots of compliments. We usually find ourselves in the healing or helping professions, and we actually do help a lot of people. Codependents have been known to give too much, too quickly. And as yoga teachers we give so much of ourselves, which is a good thing! WE JUST TEND TO OVERDO IT! From my own experience and from watching other codependents in action, I must agree. We are loving people. This is good. We forget to listen to our intuition and body signals. 1. To notice when you open up to people in a way that feels healthy to you. 2. To notice when you open up in a way that feels unsafe to you. 3. To notice when you close off to people in a way that feels like “healthy protection” to you. 4. To notice when you close off in a way that feels like “shutting down” to you. When you recall times when your heart was open, and times when it shut down, I urge you to leave out the mental judgment about these memories as being either right or wrong. Examining your own patterns with others and life situations provides you with juicy information to use in your self-discovery process. Give yourself permission to choose how much you give, when you give, and to whom. Sometimes we need to speak our truth more. Sometimes we need to censor ourselves. My codependent yogis and friends and I belong to a club. I invented it, and I call it, “The Sponge Club.” We have a blog, a mascot, and a secret handshake. We have many things in common. And we love to talk about these things that we have in common! We notice that we think differently from others and each other in distinct and sometimes peculiar ways. So, let me tell you about how I perceive us when we are in the grips of codependency conduct. Please remember as I stated earlier in this article that we have many outstanding qualities, too. First of all, we notice that we are sensitive to criticism and people’s “energy.” If we can take something personally, we will. We crave acknowledgment and praise from our families and strangers as well. If we don’t get it the way we want it, we can get angry, depressed, and start to turn that anger against ourselves. We even speak harshly about those who won’t give us the strokes we want. At times there is suffering, angst and pain in our faces and words. The world seems to stick to us like flies to glue paper. We can just be taking a simple stroll down the street, or in our cars, and if we are in one of our codependent moods, suddenly we may feel rejected because cashier so-n-so wasn’t nice to us, or Mr. Toll taker gave us a dirty look. We return home with longer faces than we had when we started out on our walk because now we start the internal mental attack. We begin thinking about what it is about us that turn people off, or what we could have done to receive such reactions. Sometimes we feel like we don’t belong anywhere in this world, and everyone is rejecting us. We think that maybe if we were prettier, friendlier, or happier people would treat us better. In some cases, that may actually be true, because we are walking around wearing our dark energy with a funky face. We haven’t learned the delicate skill of separating our self from others. We didn’t have good role models. Everything feels like our fault! Our boundaries are weak and thin. When we stick up for ourselves we may feel even worse. We absorb problems that aren’t ours to begin with. We want to understand life so badly so that we can help others, but the truth is we have no idea what trouble we are in and how to help ourselves. We can drown in our own self-pity and tell our stories to others to ease some tension, but the next time we go for a walk, we feel rejected again. The patterns keep repeating themselves, until, of course, we become aware of them. Okay, maybe I am exaggerating a bit. Does any of this sound familiar to you? If so, you may be a member of the sponge club, and not even know it yet. Yes, I agree that after reading these first paragraphs there may not seem to be many benefits to belonging to the sponge club, but becoming aware is the first step to change of any kind. Stephanie Pappas, E.R.Y.T. 500, has been practicing and teaching yoga and meditation since 1992. 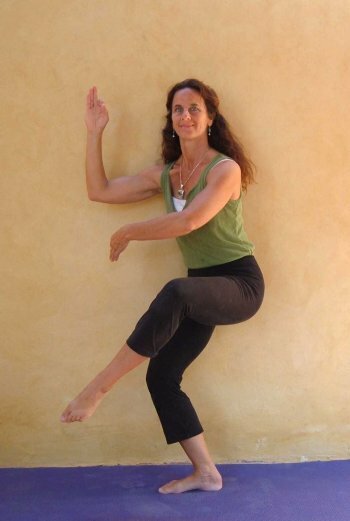 She has been training yoga teachers since 1999 through her Devalila Yoga Teacher Training program. Her book for yoga teachers, Yoga Posture Adjustments and Assisting, published in 2006 was just released in Spanish. Her newest book, Yoga at Your Wall, published in 2009, is for all levels of practitioners. All of her books are available onamazon.com. She is currently working on her latest book project, Reflections of a Codependent Yogi. Visit her blog here. She laughed. I can’t believe she actually laughed. Getting my mom to laugh before her various illnesses and progressing state of vascular dementia was challenging. How odd. Now, she laughs more. What a gift. Even if it is only once in a while, it is a gift. Just for a moment her dark house with curtains on every window, lit up. Well, she howled. Tears, snot, and drool streamed from her face. I was delighted. This is something that I probably never would have said to her in the past. Maybe because the tone in her house was always so serious and a bit depressing. Or maybe because I never helped her put her shoes on before. To me it seems that the bit of dementia that has set in has created a sort of “giddy forgetfulness” in her — as if she has always just had one glass of wine. It appears that she is happier now that she can’t think, or should I say “over-think” so much. I bet we all could use a bit this type of forgetfulness. It seems her illness has brought her more into the present moment. Who would have thunk it? Dementia = yoga. Hey Women. It is time to do something different. Put your comfort zone aside. faces bashed in on facebook. We know how to birth; literally and figuratively. We love our men, and they can be so supportive, but our men also like war games, and weapons of destruction. The fear/ego/power based part of their male brains is designed to create walls of protection for us. However the walls close us off and make others wrong. They kill others they feel are wrong. Fear and intellect overrides their hearts and they forget that true protection and safety is based on love and connection. factually see we created millions of times less suffering. businesses that will grow the truth of connection, not separation. We can feel and see that time is running out to help each other on this Earth. you have time. You KNOW it is worth it. What do you feel? What does your life stand for? one another to greatness and goodness. For the last 6 years I have only riden around town on my bicycle in this medium-sized, Caribbean Mexican town, but over these past 3 weeks I have had a rental car. I experienced the town in a whole new way, and my new perspective brought about a revelation about my recovery process relative to my last relationship—the one that took me over 6 months to get over. A few years ago, in the midst of the chaos of our somewhat codependent, dramatic relationship I had the thought, ” some day I’m going to drive by his place and it will be like driving by any other house on this block.” It was one of those surreal moments when I zoomed out of the confusion of the current situation into a more balanced future. And my intuition was right! It is amazing how real and intense something can be one day, and then another day be completely different. If people tell you that they think you are still not over your ex, or if you have any lingering doubt yourself about your feelings for him or her, do a drive by. I don’t suggest doing the drive by if you already have his stuff loaded into your back seat, and you’re ready to chuck it onto his front lawn or driveway (yes, I did this during the first month after the break up). Notice your thoughts and feelings before, during and after the drive by. Passing by their house can give you some clues about any unresolved tensions, passions, obsessions, or resentments that may be lurking in your unconscious mind. You may be pleasantly, or unpleasantly surprised by your experience. I Love You, Condition Your Hair. I bet you are thinking, what the hell does that title mean. Where is she going with this one? Well, it is a long, long standing tradition that my mother must comment on my hair, for some reason, every time I see her. Even yesterday, after 3 weeks in her hospital bed, in and out of states of delirium and dementia. I hoped that maybe this time the goodnight goodbye “I love you” could just have ended at that…sweet and silent. But noooooo. It STILL had to be followed by a comment about my hair. By the way, I happen to LIKE my hair. A month ago at my only uncle’s funeral service she just couldn’t help but toss a comment. There I was, feeling pretty and dressed up for the occasion. Hell, even my long lost cousins said I looked great (at 48 this feels like a nice compliment). And I still felt a sense of shock and wonder, after all these years. Somewhere inside me I know it is coming from her love for me, but it never feels that way when it happens. The button is still there. There is yet more work to do on my part. This last time in the hospital I asked more. I am actually becoming intrigued by this phenomenon. It may seem like nothing to you, but it was new for me. “Why are you still so obsessed about my hair?” I asked her. “I remember how it used to be.” She replied. “But I am almost 50 years old now!” I almost shouted. I left the hospital, still astounded by her constant focus on my hair, and even more perplexed by my own reactions. So, I wonder what the humid, wet, NJ weather will do for my hair tomorrow. I’m going to the hospital to see her. Let’s see what she has to say.